POST a QUESTION or READ FAQs about methods used in testing structural wood members for damage or decay & the role of micro-drilling tests for in-situ evaluation of structural wood beams, timbers, or other framing members in buildings.. According to Pilodyn and corvib.com, the Pilodyn is suitable for trees, railway ties and utility poles. Ferret (AU) adds that the Pilodyn is also suitable for testing the stability of wooden structures on playgrounds, detection of soft rot. This article compares using micro-drilling with other methods to screen both standing trees and wood structural elements for hidden damage. This article series on methods for assessing structural wood rot & damage is adapted & expanded from the author's "An Introduction to Micro-Drilling Technology for N. Z. Structural Timber Assessment" and is used with permission. We [DF] have added comments, some illustrations, and additional article citations. Scope = 40mm (density loss measurement). Generally not used on buildings. Largely utility poles only for shell decay testing. According to Pilodyn and corvib.com, the Pilodyn is suitable for trees, railway ties and utility poles. According to Ferret (AU), the Pilodyn is also suitable for testing the stability of wooden structures on playgrounds, detection of soft rot. Note: Above information is copyright, commercially sensitive and is yet to be peer reviewed. It is not to be copied or circulated without the express and written permission of Incodo Limited. Adapted here by InspectaPedia.com, with permission from Incodo 8/5/2012, technical review is in process. Continue reading at WOOD BEAM MICRO-DRILLING ASSESSMENT or select a topic from closely-related articles below, or see our complete INDEX to RELATED ARTICLES below. WOOD BEAM PILODYN TESTING at InspectApedia.com - online encyclopedia of building & environmental inspection, testing, diagnosis, repair, & problem prevention advice. [Also] Kasal B, Anthony R: Advances in in-situ evaluation of timber structures. Progress in Structural Eng and Materials. 6(2):94-103, 2004. Timber has been a structural material for bridges for centuries and numerous examples throughout the world demonstrate its durability. But timber is biodegradable and hygroscopic and regular inspections are recommended to determine the condition of the structure. This paper reports on the structural health monitoring of timber bridges in general and the long term moisture measurement inside block-laminated timber elements of several traffic bridges in specific. Presently there is no reported scientific information available on the long-term moisture behaviour and the resulting moisture induced stresses and dimensional changes of block-laminated timber elements. The paper reports on the monitoring of the moisture content of a block-laminated timber bridge. Wilkinson K, Thambiratnam D, Ferreira L. Non Destructive Testing of Timber Bridge Girders. In Proceedings Int. Conf. on Structural Condition Assessment, Monitoring and Improvement, Perth, Australia, 2005. Kasal B, Anthony R: Advances in in-situ evaluation of timber structures. Progress in Structural Eng and Materials. 6(2):94-103, 2004. Gerold M. Bloc-Glued Laminated decks for timber bridges. Structural engineering international, 12(3): 214–217, 2002. Graham T. Overview of non-destructive evaluation technologies. In Proceedings of the Nondestructive Evaluation of Aging Bridges and Highways, Ed by S. Chose, 1995. Duwadi SR, Ritter MA. An Overview of the Wood in Transportation Program in the United States, In Proceedings 5th World Conference on Timber Engineering, Montreux, Switzerland, 1998. Rinn F, Schweingruber FH, Schär E. Resistograph and X-Ray Density Charts of Wood. Comparative Evaluation of Drill resistance Profiles and X-Ray Density Charts of Different Wood Species. Holzforschung 50:303-311, 1996. Brashaw B, Vatalaro RJ, Wacker JP and RJ Ross. Condition Assessment of Timber Bridges: 1. Evaluation of a Micro-Drilling Tool. Gen. Tech. Rep. FPL-GTR-159. Forest Products Laboratory Madison, WI. 2005. [14 Simpson W. Drying and Control of Moisture Content and Dimensional Changes. Chapter 12, Wood handbook - wood as an engineering material. General Technical Report FPL–GTR– 113. Forest Products Laboratory, WI, 1999. [16d] Seavey, R.; and Larson, T. 2002. Inspection of Timber Bridges. Minnesota Department of Transportation Technical Report MN/RC-2002-34. St. Paul, MN. 43 p.
[16e] Wang, X.; Divos, F.; Pilon, C.; Brashaw, B.K. ; Ross, R.J.; and Pellerin, R.F. 2004. Assessment of Decay in Standing Timber Using Stress Wave Timing Nondestructive Evaluation Tools: A Guide for Use and Interpretation. Gen. Tech. Rep. FPL-GTR-147. Madison, WI: U.S. Department of Agriculture, Forest Service, Forest Products Laboratory. 11 p.
Pilodyn, available from Hylec Controls , was developed to determine the density and strength of dead and living wood. Invisible soft rot can be detected rapidly and objectively in an easy non-destructiveway and the reduction in strength associated with it can be determined. This can be of vital importance in the case of wooden playground structures,climbing frames and telephone masts. With PILODYN 6J Forestversion the density of the wood is determined on living trees. The damage is so little that the tree suffers no harm and the testing method is regarded as non-destructive. Testing procedure: The testing procedure is very simple: The tester is loaded with the ramrod and then pressed firmly onto the tet surface. The impact pin is shot into the wood by pressing the trigger cover. The depth of penetrationcan be read straightaway in mm on the scale mounted on the tester. 1. The tool is accurate at determining the presence of decay in timber bridge specimens. However, these data are limited to the drilling location. 2. The tool can precisely locate an internal defect (decay pocket, check, or split) within the member’s cross section. This can be advantageous for condition assessment and load rating purposes. 3. Decay indices were developed for Douglas-fir timbers as follows: sound, >25% resistance; moderate decay, 10–25%; and advanced or severe decay, 0–10%. One drawback is that multiple, time-consuming drilling would be required to map the area and extent of the decay in the other plane. Another possible drawback is the potential to spread the decay to sound areas within a timber or to sound timbers by multiple use of a contaminated drill bit. Routine cleaning of drill bits, or replacement with a new one, would greatly reduce this potential drawback. It is crucial to use this or any nondestructive testing tool or device as part of a comprehensive condition assessment. Such an assessment should incorporate an in-depth visual inspection, knowledge of prior use of the structure, and a working knowledge of fundamental engineering properties of structural wood products. 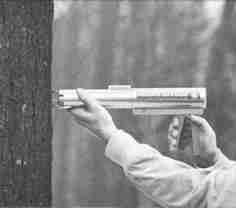 This technique, when used in concert with visual and ultrasound techniques, would provide a very accurate description of the condition of timbers. Brashaw, B.K. ; Vatalaro, R.J.; Erickson, J.R.; Forsman, J.W. ; Ross, R.J. 2004. Final Report: A Study of Technologies to Locate Decayed Timber Bridge Members. Project No. 187-6456, NRRI/TR-2004-06. Duluth, MN: UM-Duluth, Natural Resources Research Institute. Brashaw, B.K. ; Vatalaro, R.J.; Ross, R.J.; Wacker, J.P. 2005. Condition Assessment of Timber Bridges: 2. Evaluation of Several Commercially Available Stress Wave/Ultrasonic Tools. Gen. Tech. Rep. FPL-GTR-160. Madison, WI: USDA Forest Service, Forest Products Laboratory. Ross, R.J.; Brashaw, B.K. ; Wang, X.; White, R.H.; Pellerin, R.F. 2004. Wood and Timber Condition Assessment Manual Madison, WI: Forest Products Society. 74 p.
Best Practices Guide to Residential Construction, by Steven Bliss. John Wiley & Sons, 2006. ISBN-10: 0471648361, ISBN-13: 978-0471648369, Hardcover: 320 pages, available from Amazon.com and also Wiley.com. See our book review of this publication. The Journal of Light Construction has generously given reprint permission to InspectAPedia.com for certain articles found at this website. All rights and contents to those materials are ©Journal of Light Construction and may not be reproduced in any form. A professional reference designed to assist surveyors, engineers, architects and contractors in diagnosing existing problems and avoiding them in new buildings. Fully revised and updated, this edition, in new clearer format, covers developments in building defects, and problems such as sick building syndrome. Well liked for its mixture of theory and practice the new edition will complement Hinks and Cook's student textbook on defects at the practitioner level. The Home Reference Book - the Encyclopedia of Homes, Carson Dunlop & Associates, Toronto, Ontario, 25th Ed., 2012, $69.00 U.S., is a bound volume of more than 450 illustrated pages that assist home inspectors and home owners in the inspection and detection of problems on buildings. The text is intended as a reference guide to help building owners operate and maintain their home effectively. Field inspection worksheets are included at the back of the volume. Special Offer: Carson Dunlop Associates offers InspectAPedia readers in the U.S.A. a ten percent discount on any number of copies of the Home Reference Book purchased as a single order. Just enter HRBUS10 in the order payment page "Promo/Redemption" space. Or choose the The Home Reference eBook for using this reference on PCs, Macs, Kindle, iPad, iPhone, or Android Smart Phones. Note: InspectAPedia.com ® editor Daniel Friedman is a contributing author.